Lok'nStore has storage centres in many other locations, the closest being in Portsmouth. From the A27 Chichester Bypass follow signs for industrial estates at Terminus Road. From Chichester head for the Chichester Gate Leisure Park. Taking up the mighty challenge of store manager at Lok'nStore Chichester is local man Mathew Sims. Mat has plenty of storage industry experience having been with Lok'nStore since 2005. He previously worked at our established stores just along the M27 in Fareham and Portsmouth where he was a firm favourite with both the customers and staff. Lok'nStore Chichester is for personal (householders) and business storage users, serving customers 7 days a week from; Arundel, Bognor Regis, Bosham, Boxgrove, Chichester, Donnington, Eartham, East Dean, Eastergate, Goodwood, Fishbourne, Funtington, Hunston, Littlehampton, Nutbourne, Oving, Selsey, Tangmere, Westergate, Westhampnett, East & West Wittering and especially the P018, P019 and P020 areas. Lok'nStore Chichester is a modern, secure storage facility with brightly lit corridors, CCTV, loading bays and 'is not' container storage. Spread across 3 floors, the storage rooms and spaces at this store range in size from 20 square foot lockers for a couple of suitcases, up to a cavernous 500 square foot space for pallet and warehouse type storage. Access to the facility is via 4 loading bays (which can be accessed from all floors via a ramp at the rear of the building) and there are trolleys and a lift to get your belongings safely to your storage space. 'You' are the only key holder to your storage room and space - 'only you' have access. The building is fully alarmed and always staffed during open hours. 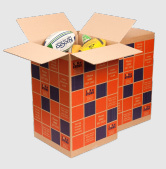 We also sell boxes and bubblewrap at the lowest costs in the industry at Lok'nStore Chichester and remember that you don't need to be using our storage to buy packing items from us. For a no obligation quote for storage in Chichester please click on the green GET A PRICE button on this page. Lok'nStore guarantees you that its storage prices are the lowest in the local Chichester area - we know this because we check our competitors prices regularly and adjust ours to be lower! Lok'nStore is the UKs most experienced storage operator with over 25 centres across the south east of England and has been trading since 1995. Other Lok'nStore storage facilities available in this south coast area are in Fareham, Hedge End, Portsmouth and Southampton.